bagforlife, mickcfc91, rhydo1888 and 4 others like this. BR: We’ve played St Johnstone four times this season, but we’ve always tried to train the players that every game is different. You have to respect every game, and we work very hard on excellency. BR: "When you’re winning games and playing well, sustaining that isn’t easy. But the beauty of these players is that they’re focused. BR: "We can always improve, we can always play better. Our objective is to get through after the weekend. 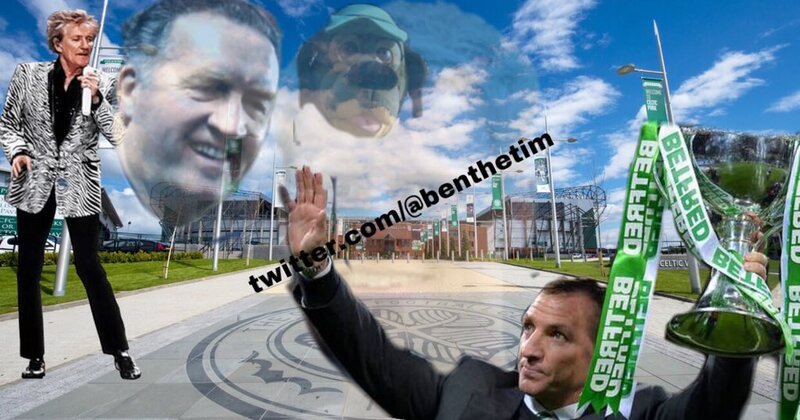 BR: "Every game at Celtic is a big game, you don’t need to magnify it any more. It’s always difficult to forecast. BR on #ScottishCup: "St Johnstone will make it tough for us, but we’ll focus on playing the very best that we can." bagforlife, The IRA, Random Review and 1 other person like this. Just heard him praising refs up here....I just don’t get him at times. BRENDAN Rodgers has sensationally called for English referees to be introduced to Scottish football. The Celtic manager insists there are too few top officials working in the Premiership and that their part-time status puts them at disadvantage in such an unforgiving and professional environment. Officials in England, working in the Premier League, are full-time. Foreign officials were brought into the league in late 2010 when Scottish referees went on strike in the wake of severe criticism and this season has seen referees been accused, among other things, of holding bias against certain clubs. The SFA’s disciplinary process has also been roundly criticised. Rodgers had kept away from the issue but his comments are bound to stun SFA bosses. The Celtic manager said: “There is a wider issue around refereeing. Do you have enough up here? Is there a big enough pool of refs or does the net need to be spread wider? "There is a real focus on the game here in Scotland, so do you need to branch that out? Should it be opened up to give more opportunities for refs to come into here - not just Scottish ones. “And I’m not just saying for high profile games. This is a fanatical football country but there’s a really small pool of referees. If something happens or they need help, there’s no way to do it. You can’t demote as there’s no one there to do it. You want to attract more referees, why close it to just here? Open it up and have the best referees that could maybe come from England or Wales, or wherever. Then you have a diverse group of referees. "Okay, they might need help with expenses or whatever, if they are coming up from Swansea, but it just opens up the pool. Asked if referees from the rest of the UK or overseas should be brought in just for the bigger matches, such as Old Firm games, Rodgers said: “It’s about where the needs are. There’s probably no need in England, the country is bigger and they have full time referees. There is a clear pathway for them. “It just seems here the pool is shallow. Up here they are a big younger, they are not full time, so how can we help them?" Celtic left-back Emilio Izaguirre is a doubt for Sunday’s Scottish Cup tie with St Johnstonehaving been the victim of bad challenge by Hibernian’s Darnell Johnson who faces a two-match ban but received a yellow card by Craig Thompson. And the inconsistency of the disciplinary process this season in terns of retrospective bans has been an issue for Rodgers and his contemporaries. “I don't tend to go after the referees in these situations as it's simple for me. The poor guys refereeing the games are amateurs. with all due respect. The spotlight is on them severely from a professional side. Brendan learning French as well as speaking fluent Spanish. Why not say that would be a big benefit to US next season if he was here! The language of football is rich and varied. You would be surprised, for instance, how many profanities a critical fan can shoe-horn into a heated conversation about the tactical merits of the false nine. Brendan Rodgers, meanwhile, remains something of a footballing linguist. The Celtic manager is learning French and he is already fluent in Spanish. It’s a handy string to the bow in these multi-cultural times. Young Maryan [Shved], the player we signed from Ukraine was a great example of what language can do. He didn’t speak English, I didn’t speak Ukranian but we could speak Spanish because he had two years at Sevilla. “If I could do two things in the world I’d speak every language and I would play every musical instrument. Why? It’s the ability to communicate. As you grow older you understand communication is so important. With the first leg of a Europa League last 32 encounter with Valencia coming up this week, Rodgers’ ability to speak the lingo may come in handy when he comes to deciphering the various barks and bellows coming from the Spanish dug-out in the heat of the battle. Rodgers’ passion and respect for all things Spanish is considerable. In his formative coaching days, he would make visits to Valencia to absorb the various approaches and techniques while he continues to harbour ambitions of, one day, exploring new horizons on the managerial front. I’d like to manage abroad,” he said as he afforded himself a glimpse into the future. “I’d like to get out of my comfort zone at some point over the next 20 years. Spain is a country I’ve enjoyed learning the culture of and speaking the language opens up South America too. I’ve loved going to Spain. It was so refreshing to go over there [early in his career]. Valencia were one of the clubs where youth players came through. They were very open and there was nothing hidden. Those relationships will be put to the side on Thursday night as Celtic look to win a knock-out tie post group stage in Europe for the first time since Martin O’Neill’s side beat Barcelona in 2004. There is a school of thought suggesting that the break between the group stages finishing and the head-to-head matches kicking in can disrupt the momentum. Rodgers is having none of that. with a great history but that doesn’t give them 12 men. The arrival on loan of new recruits like Oliver Burke and Timothy Weah has bolstered Rodgers’ options. Nurturing young talent and getting them to make the most of their abilities and potential has always been one of Rodgers’ great strengths. he arrival of Weah and Burke, who have been farmed out from Paris Saint Germain and West Bromwich Albion respectively, has had mutual benefits, even though keeping such talents in Glasgow in the long term is something of a pipe dream. “He [Weah] has been a breath of fresh air,” said Rodgers. “If he’s not out on the training pitch, then he’s out watching. He loves being here. That’s great to see in a kid who really wants to be a player. He’s not expecting it to be handed to him. I’ve been delighted with him. It’s a great challenge for us to help him develop and we get the benefit. “It would be great for Celtic [to keep Burke] but the reality is that the improvements he will make here over the course of the next six months will probably excite West Brom and then if they get promoted probably his wages change anyway. Helping Celtic help themselves in Europe is next. Another record broken by this beautiful human being. 24 cup wins beating ‘sir walter of cardigan’. PEI#1, Clint Eastwood, StPauli1916 and 7 others like this. Republika Hrvatska, Gabriel and Gyp Rosetti like this. So thorough, professional and focussed. We look excellent just now and will only get better as we get players back into the squad. I thought todays performance was 1stseasonesque ! JC Anton and StPauli1916 like this. BR: "I thought we were very good in the first 20 minutes. We were quick in our passing, created chances and got the first goal. That was important, particularly against St Johnstone who defend well. BR: "I thought after that we got a bit sloppy. They got an opportunity and Scott Bain had a good save. But in the second-half, we were excellent. It was a good performance and we’re through to the next round." BR: "Scott Sinclair is one of the few players who can keep up with Ollie Burke. That’s what he does, he’s a goal-scorer. Guys like Johnny Hayes, too, they aren’t playing as much, but he was great and he defended well. That’s testament to how professional he is." BR: "Ollie Burke took a knock to his ankle, but we’re hoping he’ll be okay. He was absolutely fantastic today. Ntcham had a tightness in his hamstring, which he felt before the game. Jozo was feeling ill at half-time, but Kris comes in and does a great job." BR: "Today was another good performance. Thursday is a big step for us in terms of quality, but I can’t complain, we’re into February having not conceded a goal. Valencia will be about confidence. We bring confidence into the game and we understand the opponent." Every recruit is making an impact as well..
We're only gonna get better in the next few week's. Ominous for everyone else..
StPauli1916, rhydo1888, JC Anton and 1 other person like this. FranceCelt, Clint Eastwood, StPauli1916 and 1 other person like this. His domestic record is absolutely sensational. That type of language gets pinged about too easily but one look at the stats shows you it’s completely genuine. Not even a sniff of a replay in the cup competitions over 2 and a half seasons. Every competition he’s entered he’s won and he’s in pole position to do it again this season. Which would be monumental on a huge scale. Clint Eastwood, JC Anton, StPauli1916 and 2 others like this.